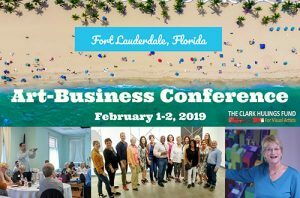 October 25, 2018, Fort Lauderdale, Florida – The Clark Hulings Fund for Visual Artists (CHF) is excited to announce its Art-Business Conference in Fort Lauderdale, an event that seeks to inspire visual artists to “Conquer the Changing Marketplace.” This weekend-long business- development workshop will give professional working artists the chance to take a deep dive into the business side of their art careers. Scheduled for February 1 and 2, 2019, the event is funded in part by the Broward County Board of County Commissioners through the Broward Cultural Council. The two-day conference is co-sponsored by ArtServe, an active incubator for Broward County’s growing art community.